Finished! Yay! And other stuff. If you are a writer, there is one word in the English language which is particularly sweet: DONE. As in, you have completed your first draft, and your novel is finished. Or, you have finished all your many rounds of edits (you thought there was just one? sorry, no) and have made the book as good as you can get it. That's where I'm at with my current novel, PENTACLES AND PENTIMENTOS. Done. *Insert happy dance here* Thanks to invaluable feedback from my critique partner, the amazing Robin Wright (check out her blog at www.writingforfun.blogspot.com ), and a few other authorly friends, I am as done as I can be for now. Which isn't to say there won't be more edits down the road, as I get more feedback. But for now--done. Sing it with me, people! So what's next for P & P? It gets sent out to my top choices for agents--in this case, folks who read one or both of the previous two books and said "Close, but not quite there yet--but feel free to send me the next one." And we all cross our fingers. In the meanwhile, though, I am catching up on a few projects (like writing up the workshops I'll be teaching at Pantheacon in February and online in March), writing an Imbolc ritual for this weekend, and yes...starting to think about the next book. Because here's the other thing about being a writer. You're never really done. You're only done with your last book, and getting ready to work on the next one. Here's hoping that you get to say "done" about a major project soon...and have something fun waiting to be begun. I was talking to my beloved editor at Llewellyn, Elysia Gallo, last night about the cover for my forthcoming book (#5), Witchcraft on a Shoestring. The cover we were talking about is still in mock-up form (like a rough sketch, but on computer) so there's nothing to show there yet. 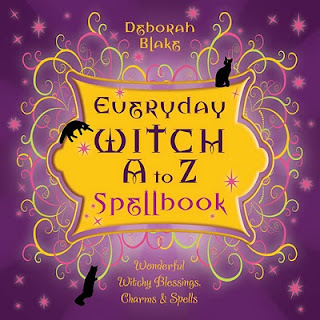 However, the discussion reminded me that I hadn't posted a picture of the cover for book #4, The Everyday Witch A to Z Spellbook, coming in July. Yes--I actually have two books coming out this year, just a couple of months apart! Can't quite get used to it, clearly. So here it is... TA DA! They are both good for 10% off! enjoy! ANd let me know what you think of the cover, please. The bad news, is that I did it last Saturday, and didn’t get around to blogging about it until today—a week later—despite my goal to blog more regularly. (Drat.) Still, there were extenuating circumstances, and at least it’s not as bad as my blog reporting on my NANOWRIMO experience last November…which I still have yet to write. The extenuating circumstances were pretty major, too. The break-up of one of my most treasured and important friendships. Ouch. It really threw me, and I didn’t much feeling like “wooting” about the finished manuscript until now. One of the casualties of the friendship imploding was my plan to go to the RT convention in Ohio at the end of April. My friend and I had planned to go together, give a workshop, socialize with some of our author and agent pals, do some networking, and celebrate my 50th birthday in style. She’s still going. I’m not. So the new plan, probably, is to celebrate my birthday here in town with my lovely circle and a bunch of other pals, and maybe go to the RWA convention in July instead with best bud Robin. No half-naked male cover models (as there would have been at RT), but you can’t have everything. Tomorrow my coven will gather at my house for a slightly belated New Moon project: putting together focus boards for the new year. This is a project we’ve done for the last two years, and it seems to work well for us. For those of you who have never made one, a focus board is simple: write down a list of your goals for the coming year, cut out words, phrases and pictures from magazines or catalogs that represent those goals, and paste them on a piece of poster board. Then put the focus board where you will see it on a regular basis, to remind you to focus your energy and intent on those goals. This year we will be adding something new: a joint focus board made by all the women in the circle, as a goal focus for Blue Moon Circle itself, to keep us moving in a good direction as a group. Hope you all had a wonderful (and trauma free) week. This year I am feeling really good about where I’m at in life. Not that my life is perfect, or that I have everything I want (although things are pretty good, for the most part, there are things I would improve). Mostly, I feel like I have done a lot of hard work over the last ten years—in a lot of different areas of my life—and I believe much of what I have been working toward is on the verge of coming to fruition. This is the years that dreams come true! Overall goal: embrace success and happiness on all fronts!